The Raiders are bad. But on the other hand, they’re also old. The strangest roster in the NFL is also the most dysfunctionally run, with no one really sure who’s making the decisions. “Some of [GM Reggie] McKenzie’s own personnel staffers,” Yahoo Sports reported earlier this month, “were not entirely clear on what he was or wasn’t allowed to engage in.” The Khalil Mack trade was, by all accounts, Jon Gruden’s show—with one report going so far as to claim McKenzie didn’t want to do it. Some free agency decisions were made without McKenzie having any input, according to that Yahoo report. What you want to do here if you’re THIS GUY [gestures to Mark Davis with telestrator] is to make things even more of a mess this season by lame ducking the GM and committing the future of the franchise to a guy who hasn’t proven he knows how to build a winner in the NFL since the Bush administration. A CBS Sports report today all but comes out and says the Raiders are going to fire McKenzie following the season, and everything else aside, a team that’s already planning to fire its GM 16 weeks in advance is not a team that’s in a healthy place right now. [A]t this point executives around the NFL would be shocked if Oakland does not shake up its front office in 2019. Yes, it’s still early, and the Raiders have only played one game under this management group, but the dynamics between [Gruden and McKenzie] have not been great and Gruden’s actions and comments alone point to significant change in the offseason. [N]umerous general managers, personnel directors and NFL officials would be shocked if there are not new decision-makers in place in Oakland well before the 2019 draft. McKenzie is signed through the 2020 season. 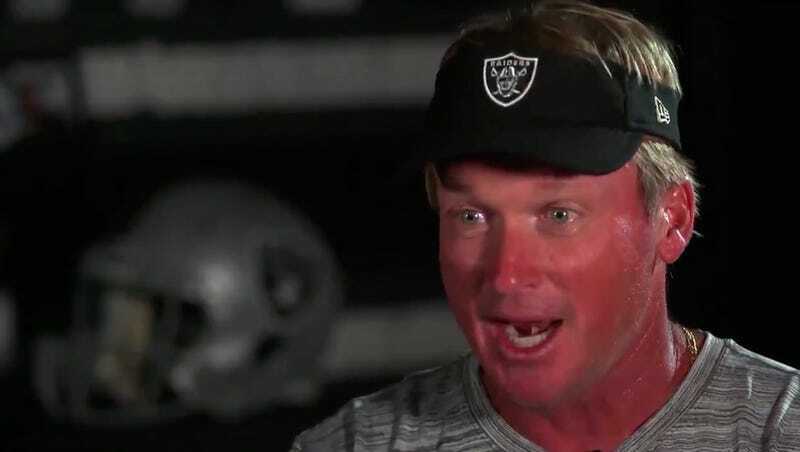 Gruden is signed through, oh god, 2027.